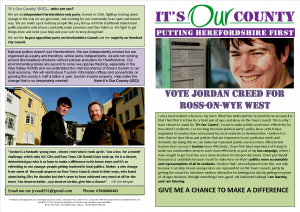 24 year old Jordan Creed, a bus campaigner from Ross-on-Wye, is our candidate for the Ross West Town Council by election. Ross is a town everyone assumes is Conservative, hence Jesse Norman MP will turn up for the opening of a packet of crisps here (quicker than a seagull) but Jordan is hopefully going to prove there is more to the town than meets the eye and it’s not all painted blue and faded yellow; and we are proud to try our best to represent those crying out for choice and change in this great little town on the hill. Ross is notable for a few things and the most notable of those (apart from Jacqueline’s Nite Spot, now sadly closed) is John Kyrle, the famous philanthropist who did so much for the town and townspeople. “He was generous to the poor and spent all he had in good works”. Not unlike our Conservative Cllrs then…urmm, mnnnn. Jordan is keen to listen and to learn, please give him chance to prove he can a difference.